Stuttgart, capital of the state Baden-Württemberg and Germany’s sixth largest city, definitely knows how to combine good old German traditions with a modern sophisticated life style! Experience party life and tranquillity in a city where cultures clash. 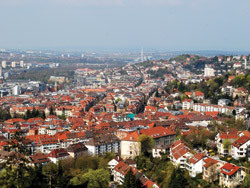 Stuttgart, with about 600.000 inhabitants, is a very international city with people from over 180 countries living and working here. You will find traces of multicultural life everywhere in Stuttgart.